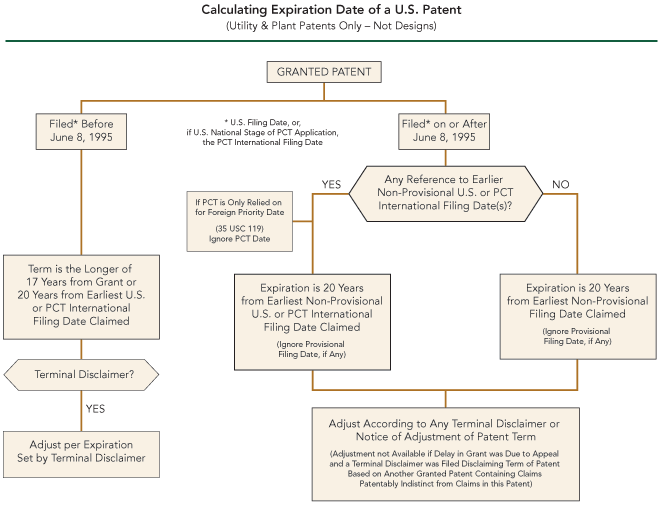 For applications that were pending on and for patents that were still in force on June 8, 1995, the patent term is either 17 years from the issue date or 20 years from the filing date of the earliest U.S. application to which priority is claimed (excluding provisional applications), the longer term applying. Design patents, unlike utility patents, have a term of 14 years from the date of issue. If the United States Patent and Trademark Office fails to examine a patent application in time (deadlines for various steps are different), the patent term may be extended. Extensions or other delay taken by the applicant can reduce or eliminate the extension. The patent term may also be reduced by any disclaimer (called a "terminal disclaimer") to the patent term. A reexamined patent expires on the day the original granted patent would have ordinarily expired. If a patent application is obvious in light of one of the applicant's existing patents, the applicant may be required by the USPTO to disclaim a part of the term. For example, an applicant's patent A expires on December 24, 2000. The applicant filed another patent application two years later. Under some conditions, the second patent might expire later than the first. If the applicant files a terminal disclaimer, then the second patent will expire at the same time as the first, the extra portion having been disclaimed. In filing the terminal disclaimer, the applicant also agrees that the second patent will only be enforceable if it and the first patent are commonly owned.